First know that former Beachwoodite (Beachwoodan?) Eric Desatnik, though he now has his name in the Internet Movie Database - which is just as good as the footprints in front of Grauman's Chinese Theatre - does not aspire to be a big-league movie mogul, unleashing one comic-book superhero after another on us. The Yale graduate is, in fact, the public voice of Wild Aid, a San Francisco-based nonprofit that seeks to halt exploitation of animals and endangered species. Yet Desatnik has a movie credit that most LucasFilm wannabes in film school would envy: Executive Producer on the acclaimed new nature documentary THE WHALE. "We've released theatrically in New York City, LA, Seattle, and DC - and we are opening in Cleveland on November 4, at the Capitol and Chagrin Cinemas," he said. "We were named a Critics Pick by the New York Times and the Washington Post. It's truly a special film. And, oh yeah, I'm also a native of Cleveland, so this opening is very important to me." 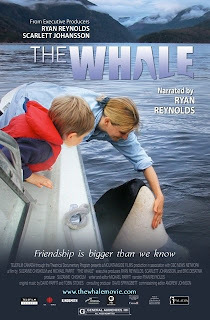 THE WHALE relates the saga of Luna, a young orca whale who somehow became separated from his family off the coast of British Columbia and made his adopted home alone in a narrow stretch of sea between mountains, a place called Nootka Sound. An wild orca apart from its pod usually languishes and dies, but Luna instead instantly habituated to the human maritime community around Nootka Sound - its loggers, pleasure boaters, children and Indian canoe paddlers. Soon the playful giant's friendly interaction with humans becomes so close that Canadian wildlife officials and bureaucrats try to intervene. But how to tell a whale what to do when he sets his mind to it? Husband and wife filmmakers Suzanne Chisholm and Michael Parfit first covered the Luna dilemma in a film entitled SAVING LUNA. It made the festival route as well, earning good notices without landing a major distribution deal. But it did reach the attention of the well-connected Desatnik. "I discovered the the story of Luna in the process of running the Environmental Film Festival at Yale, which I founded," said Desatnik. "I brought the project to Reynolds, whom I know from having worked at a talent PR firm in Los Angeles." `Reynolds' means Ryan Reynolds, the name-recognition star of THE PROPOSAL, the DC Comics superhero adaptation GREEN LANTERN and other mainstream films. The Canadian actor grew up in British Columbia and was immediately drawn to the material. He signed on as well as an executive producer. "And he brought his then-wife Scarlett Johansson," said Desatnik - who noted that Johansson just finished shooting a movie (THE AVENGERS) in Cleveland. Starring, of course, as a Marvel superhero, Black Widow. It seems one can't get away from the superheroes. "Both remain incredibly passionate about this project," said Desatnik of the onetime couple, "and we're lucky to have them involved." A new movie was prepared by Chisholm and Parfit, this time with alternate footage, different emphasis, and Ryan Reynolds narrating. This became THE WHALE. Said Eric Desatnik, "I think the beauty of the film is it raises questions but does not provide answers. I don't know what I would have done. I know that I would have wanted to reunite Luna with his pod, but as the movie demonstrates, the situation was a lot more complex than that." Cleveland has a fairly exclusive look at THE WHALE, which is currently being booked at festivals and on a city-by-city basis, sometimes in territories where marine ecology - and whale-hunting - are hot-topic issues. Any movies next on Eric Desatnik's slate? Maybe a live-action Captain Planet and the Planeteers? "I'm not a filmmaker, I'm an advocate. If another story comes along as special as this one I'll consider it. But in the meantime I am fully committed to my work at WildAid."